355 pages | 135 Color Illus. The threat variables associated with military ordnance are enormous, requiring the application of a structured process to identify unknown munitions. 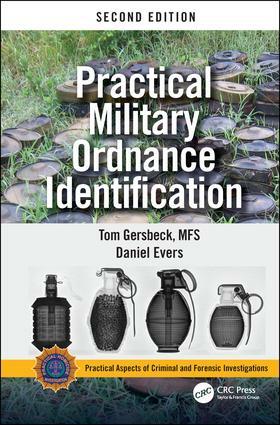 The focus of Practical Military Ordnance Identification, Second Edition is the application of a practical deductive process to identify unknown ordnance items that are commonly recovered outside military control. The author supplies a seven-step procedure to identify unknown munitions by their category, group, and type. Detailed logic trees help users narrow down the possibilities in order to accurately identify ordnance. The book covers the safety precautions associated with each category and group of ordnance. It describes many ordnance construction characteristics and explains the fundamentals of military ordnance fuzing. Appendices define terms and supply abbreviations and acronyms used to describe military ordnances. Coverage new to this edition include: a list of conventional markings; additional safety precautions to take; an expanded list of high explosives; additional technical details on explosives effects; hazards associated with pyrotechnics, pyrophorics, smoke compounds, and incendiaries; a section on pre-1870 projectiles, hand grenades, landmines, underwater ordnances, and rockets; and details on Man-Portable-Air-Defense-Systems (MANPADS) missile systems. explosives security specialist before deploying as an independent contractor. Golden West Humanitarian Foundation in Cambodia. Academy of Forensic Sciences (AAFS), and continues to work in his field.